Earlier this week, rumors suggested LG’s first smartphone with a curved display, LG G Flex was rumored to launch on three major US carriers in the coming months, including AT&T, T-Mobile and Sprint, according to our very own @evleaks.. There’s no confirmation about the launch of the LG’s curved smartphone on Verizon. Now, we have another reason to believe @evleaks could be right as the handset turned up on the FCC with LTE Bands for AT&T and T-Mobile. 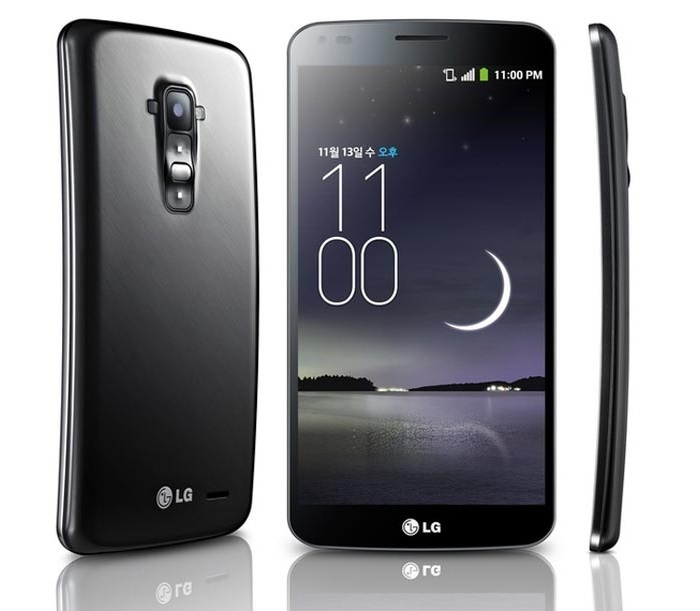 LG G Flex comes with a gigantic 6-inch display boasting a resolution of 1280 x 720 pixels with the display curved vertically from top to bottom, and runs Android 4.2.2 Jelly Bean out of the box. Under the hood, the device packs a quad-core Snapdragon 800 chipset with a clock speed of 2.3GHz with 2GB RAM and 32GB internal store, but doesn’t bring support for expandable memory via microSD card. Other features include 13MP camera on the back, 2.1MP front-facing camera, WiFi, LTE and a massive 3,500 mAh battery. There’s no word about its pricing or availability on AT&T or T-Mobile, but we’ll let you know as soon as any carrier confirms the availability of the device. FCC is usually the last stop for devices before they hit the shelves.